A brief survey of the benefits and disadvantages of several types of popular Grow Lights. We will look at HID (MH & HPS), Fluorescent, LED, Induction, and Plasma Lighting. High Intensity Discharge lamps, commonly referred to as HID generally use MH (Metal Halide), HPS (High Pressure Sodium) some HPS lamps are designed to be Broad Spectrum lamps (more like white sunlight) and are sometimes used for VEG and Flowering. Many growers using HID will utilize MH for VEG and HPS for Flowering, some growers use a standard HPS for VEG and Flowering or a Broad Spectrum option. If you only have space or money for one VEG/Flower space use HPS. The least costly initially for HID fixtures only. Proven to be consistently excellent for large yields and quality product. Replacement lamps are widely available. Uneven spectrum with excessive Green/Yellow means a bunch of photon energy is not used. Hid Bulbs use filaments and sealed metal caps. The seals allow gas to escape causing the output and spectrum to degrade in 2-3,000 hours. Replacing bulbs frequently can become costly. High energy requirements may become costly. High heat production can drive cooling costs up considerably and effect production and health. Ventilation and AC are generally required. High heat in Greenhouses may effect production and plant health. Require Compatible Ballasts and Reflector Hoods. Good quality and intense output of light, MH has a bright white light that is rich in the blue region. Some Growers prefer the light from MH bulbs, they are easier to work under and to see true plant colors. Cheaper alternative to many grow lights and lamps. Compatible ballast and reflector are needed for operation. Replacement every 8-12 months depending on daily usage. Good quality and intense output of light – a light that with added red and orange spectrum. Another cheap alternative to other indoor grow lights. A good spectrum for flowering. High heat output, a ventilation and AC system must be added. Replacement every 4 -8 months depending on daily usage. These are sometimes combined with Fluorescent and Induction lighting to get great results with less energy. Cool running and can be used very close to leafy structures. Low heat produced & electricity used for small plants or clones. Great for filling in shadowy parts of the plant with more light, or can be used as side lighting. Used outdoors and in the greenhouse as under lighting to accelerate growth and or for extending lit hours. Great choice for seedlings, clones, and small vegetating plants. T-5 tubes are more energetic and can be used for VEG and some use them for Flowering. Used as side lighting and supplementing HID to extend the day with less energy. Al but T-5's must be run very close to the canopy, but, even T-5's have limited penetration. If used in the Greenhouse or Outdoors they must be waterproof, which increases the initial cost. Tend to not be energetic enough for Flowering. The larger fixture footprint as opposed to output make Fluorescent lamps ineffective in the Greenhouse. Plants generally can be grown only to about 1' in height, 2' with T-5 lamps. NOTE: Low energy lamps can be helped with a longer flowering day, to achieve a 13, or 13.5 hour day utilize The Flower Initiator. HP4s is the world newest HPS grow lights technology, powered by Alta LED and their newly discovered Phoquan technology. Covered by many protective patents, this LED lighting technology is for growing indoor plants at an impressive rate. The technology is not only full spectrum lights but comes closer to replicating the sun more so than any other product on the market. The technology is partnered and paired with many Universities around the world bringing hands on testing in documented grow situations for urban farming made in the USA LED lighting. LED = Light Emitting Diode. Initially LED Grow Lights had very limited spectrum and lasted no where as long as the advertised lifespan. Experimenting with them was a bit frustrating, due to this interest died prematurely. LED lamps have doubled in efficiency and light output about once every 36 months since the 1960's. In recent years to 3 and 5 watt diodes have greatly increased intensity. Most recently the advent of COB LED clusters has shrunk the area needed to provide much more energetic lamps, with very reliable lifespans. LEDs have far lower energy consumption HPS lighting, the energy savings is mostly due to less waste to heat. Precise constant current (power) management is required with high power LEDs when comparing performance to HIDs. However, LEDs have much lower power consumption in their drivers while the HID lamps use normal power factor ballasts which add another 150 Watts of power consumption for cannabis. LED may be more expensive initially when compared to HID but they are cheaper over the long term for cannabis growing due to energy savings and no need to replace bulbs regularly. LEDs are safe, classed as ‘Class 1 LED product’ as they do not contain mercury like compact fluorescent lamps. The newest COB diodes are very powerful and long lasting, with a very small footprint, a lot of light in a small space. Less costly solutions are arriving soon. 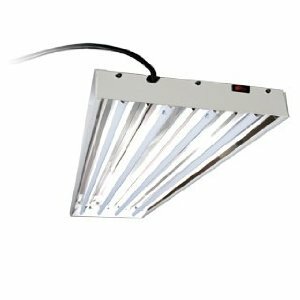 The initial cost of the LED lamps can be quite substantial, as with many things and particularly with Grow Lighting, you get what you pay for. Lamps that are lower cost initially may prove to be more costly in the long run. You may have to use more lights, closer together, than manufacturers suggest, depending on the manufacturer. With many models the diodes cannot be easily replaced, but many of the newest, most advanced lights, do have that capability. Initially the spectrum was pretty limited and jagged, but with the advent of Broad Spectrum COB lamps this no longer is a big issue. You may determine that a Hybrid lighting solution will provide great results, by adding Special Far Red Frequency lamps may be supplemented to provide tighter buds with some lights. This may not be required with some more advanced LED Grow Lights. First introduced and patented in 1891 by Nikola Tesla, induction lamps, while expensive, were always prized for their High Lumens per watt, Low Operating Temperatures, Crisp Color, Long Lamp Life and Low Lumen Depreciation over their entire life. The Magnetic Induction lamps, I prefer are Inda-Gro EFDL Broad Spectrum, these lamps have combined the proven benefits of this technology while supplying unique spectral requirements so essential for robust plant development. Induction lights don’t lose light intensity and will not slump in spectrum as fast as MH or HPS grow lights, they stay close to their full initial brightness even after running for 70,000 of hours. Induction runs cooler, like fluorescent lamps and can be run very close to leaf tissue without burning. The Inda-Gro driver housing will run in the 46C (114.8F) range while the surface of the lamp will run in the 93C (199.4F) range. Compared to an HID lamp that runs @ 482C (899F), these lamps run substantially cooler than comparable HID grow lamp. With Inda-Gro the UV-B light makes for more Trichome production and less mold, mildew and health issues. In the Greenhouse or Indoors proper grow light with a sunlight-like spectrum, tweaked to make it more efficient, can also mitigate disease pressures that are often seen with plants grown under lights with limited spectrum and higher temperatures. Inda-Gro Induction lamps have a very synergistic effect in the Greenhouse environment. Broad spectrum phosphor blend provide plants with vegetative through flowering spectrum from a single lamp source. Capable of Instant On/Off switching and variable dimming. Modular integration with available greenhouse management and daylight sensing control systems. 95% Par Usable UV and IR Spectrum. Consistent intensities and stable spectrum for repeatable crop production values. No Grow Lights VEG as well as Induction. The initial cost of Induction Grow Lighting is high in comparison with HID, but energy, maintenance and bulbs savings compensate over a one to two year period. Flower density has been reported to be less than with HPS. but the addition of Deep RED solves the issue. Some grower will use one 600 watt HPS lamp with 3 400 watt induction lamps to achieve similar to HPS results with energy savings. With Inda-Gro the PFR Pontoon is available to boost Deep RED with a simple add-on device. Some growers have added The Flower Initiator, extending flowering to 13.5 hours for enhanced flower production. Offers a full-spectrum light, similar to that of sunlight, for both vegetative growth and flowering.Longer lifetime - may last up to 30,000 hours. Since they do not contain electrodes or filaments, the parts of many indoor grow light bulbs that break often, they last longer. Low heat output when compared to HID indoor grow light options. The newest, yet to be released, Plasma lamps have a simple to replace bulb and reflector, for 30,000 hour replacements. UV-B and IR output helps with Trichome production and reduces health issues. The newest, yet to be released, Plasma lamps,have solved the problem of Magnetron failure, the Magetron spins constantly, with a simpler RF system, for the plasma reaction. Higher initial investment for Plasma lighting than for HID systems. Magnetron failure with older systems, not so with a soon to be released system. Sulfur Plasma bulbs lose output after 30,000 hours and cannot be replaced by the end user, with older systems. The newest, soon to be released, lamp solves this problem. Require added Deep RED spectrum to complete dense flowering. Not so with the upcoming lights. I hope this article is of use in the understanding of the various popular Grow Lighting systems. Best of Luck with your purchasing decisions. Please make comments and ask questions here. Contact me, Bill, if you have further questions or require personalized customer service. » What are the Benefits of Grow Lights and How do They Compare? » Greenhouse Lighting - Products to Optimize for Production and Energy Savings. » Recent News now also functions as a Blog.